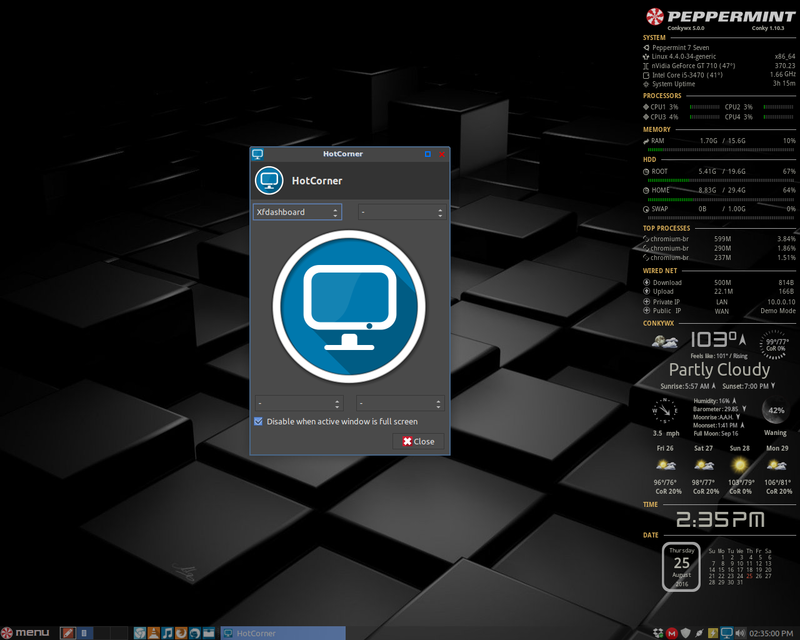 I've been rather away from this forum, and well, even though i'm not necessarily using Peppermintos for now (Weird reasons for not to, but well, still love it as a "Deploy and use" distro for some situations) i would like to know what you all think about DEs and WMs you ever tried out, such as Mate, KDE, Openbox, I3wm, and of course a huge ammount of others i did not mention. 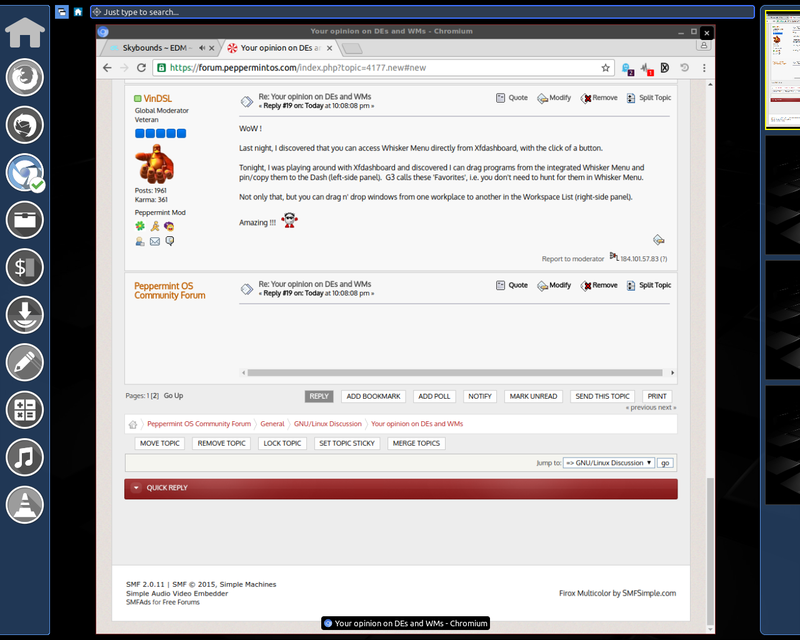 Feel free to mention "Mix n matches" like PeppermintOS' "Xfce/lxde/mate/love"
I'm not entirely sure if is needed, but i think using the Spoiler would be good, as those "mini-reviews" of yours can be lengthy, just like mine! KDE : Honestly, it's flashy, amazingly refined-looking and all, but i feel it's too heavy, but that might be because my computer is rather weak. It never really booted on post-instalations, but Mint KDE (17) worked, but i really don't feel like using KDE/Plasma, but i do give a thumbs up for the beautiful work that is K3B. Unity : First DE i ever tried, on regular old Ubuntu, never really bothered me, although i didn't know how to make any customizations it served for the very first times. Honestly is not too bad looking, but well, heavy and not really good, but again, purely my opinion on that, not horrible, just a bit too "loaded". Gnome 3/Shell : I have very mixed feelings around it, mostly because i tried it just a few times, on Fedora and on a "FrankenXubuntu" not bad, but not too good either. LXDE : My ex-favorite DE. At the start it felt horribly bad looking, like to the point it made me think Window$ XP had a good environment. But that changed soon after some weeks of trying out, turning out to be fast and reasonably easy to use, although difficulty gaps for things, and some weird "rare" bugs of doom, it felt at home pretty well, but something was missing, something to yell "This is not Window$, this is GNU/Linux!" Mate : My all-time favorite DE. I ALWAYS liked it, even though before i thought on sticking more with XFCE/LXDE. It had a nostalgic, weird feeling, as i never used Linux before, but it felt very well. Editing the menu wasn't hard, changing themes felt very good and appealing, the overall aesthetic was beautiful, and it simply changed a lot of things to me, showed me a lot of things. Although i'm honestly not a super fan of Linux Mint, Mate felt very, very good, definetly worth to check out, in my opinion. Cinnamon : Mixed mixed, that seems to be the idea i have of most environments. This looks good, and appeals after tweaked, but it has been pretty buggy on my end, and not exactly light-midweight, this might be because i never really tried to bother much with it, but well, my 2 cents, decent, although not my favorite pick, or a pick i would really use. Openbox : This honestly was and still is one of my favorite ways to use linux. It takes sometime to setup, but it's very nice. Looks and performs well, gave me the bad habit of right clicking my panels for some decent time but really, a nice addition to light setups imo, also, a classic, just like Mate, but in a different way. Fluxbox : Although i liked tweaking Openbox better, Fluxbox is considerably easier, and has some nice features imo, which could be useful someday for me. really enjoy it, although i've hard some hard time finding appealing (to me) themes, it is definetly one of the most useful (Standalone) Window Managers imo. I3WM : Other go-to for me, simply amazing once you get the hang of it. although i never used it the way it was suppossed to (Tiling), i found the "tabs" very good for what i do, the abillity to fullscreen in and out of anything is very nice as well, making playing videogames a bit easier, in case i really need to check time or so, rather than alt-tabbing and lagging a bit more. Performing very well, just like Fluxbox performed better than Openbox, this did a lot better than most DEs i have tried out, even though some came pretty close with my editions. I like xfce desktop and XFWN window manager. I am a huge fan of the xfce desktop. It's very lightweight, and if you spend the time you can make some very attractive desktops to work with. Kde, Mate, Flubox, openbox...I don't no. I never used them. Only xfce and now...Lxde on Peppermint 7 and i love it! I'm an unashamed G3 fanboi. When I'm testing the Ubu dev branch, that's the DE I prefer, i.e. Gnome-Shell. In defense of G3, I feel compelled to inform others that Unity is not a DE. 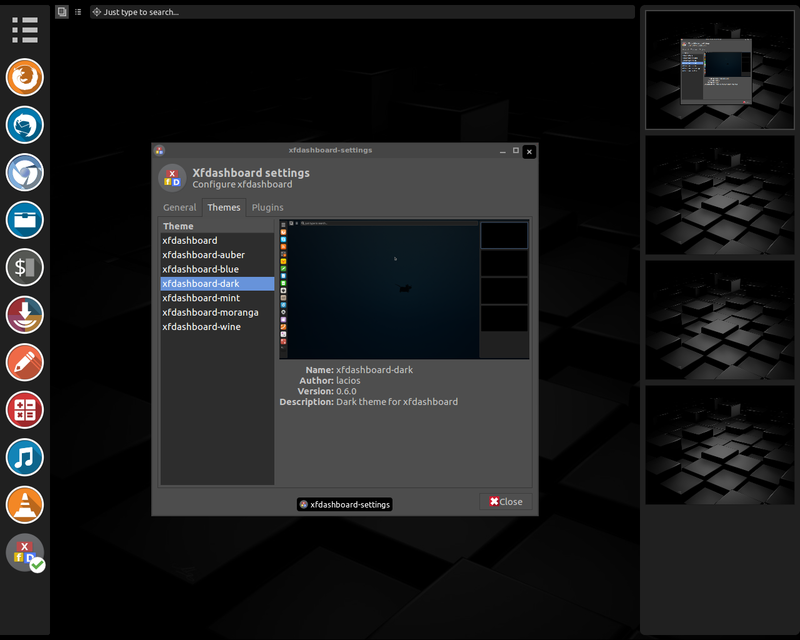 Unity is a simply a Compiz plugin for G3/Gnome-Shell. I don't dislike Unity. As a matter of fact, I defended it in the Ubu forums for a couple of years, when it was first released. Everyone was complaining about their inability to customize Unity. Nonsense ! Since Unity is G3 + Compiz, all one needs to do is dual-boot the Gnome Shell and customize it. G3 and Unity share the same core files. Anyway, I prefer to use the real thing (G3), not the Compiz hack (Unity). The only thing I miss in Peppermint is the G3 hot-corner feature. I've actually been haxoring a 'xfce4-panel' hot-corner plugin. Peppermint desktop. Can't really call it LXDE or XFCE, since it's neither. It uses bits from LXDE, XFCE, Gnome and MATE. I think it all works great together, better than the desktops from which the bits come. As for more mainstream desktops, I like XFCE. If not for Peppermint, I'd probably be running Xububtu or Mint XFCE. If not for Peppermint, I'd probably be running Xububtu or Mint XFCE. I think I'd would be too, or maybe SolydX. It's the community that keeps me here, not so much our DEs. That said, I really like our DEs. I'm particularly fond of Peppermint's Xfce and LXDE DEs. I have to say that Manjaro's Deepin DE is interesting. My problem with it is that I'm not well versed with Arch commands for its terminal, and I like, and feel comfortable with, the Debian/Ubuntu style of apt-get commands. Peppermint always has very user-friendly DE. I guess there's no reason to reinvent the 'hot-corner' wheel, eh what ? I thought about adding it to PM7 but I think we decided against it during the dev process IIRC. What's the difference between Hot Corners and XFdashboard or are they one and the same? Oh and On Topic - Peppermint DE is the Best - A perfect Blend. Creds goes to Brian Hsu, over on GitHub. I just had to find a way to shoehorn it into Peppermint 7. That's part and parcel to the 'Peppermint Ethos', yes ? 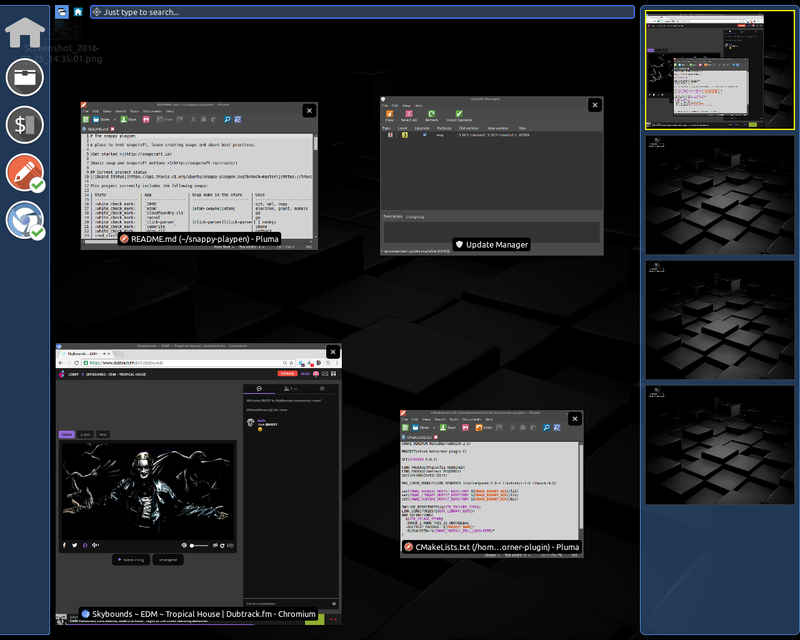 The XFDashboard is just what it says, a dashboard (similar to the G3 dashboard but simpler) for Xfce. 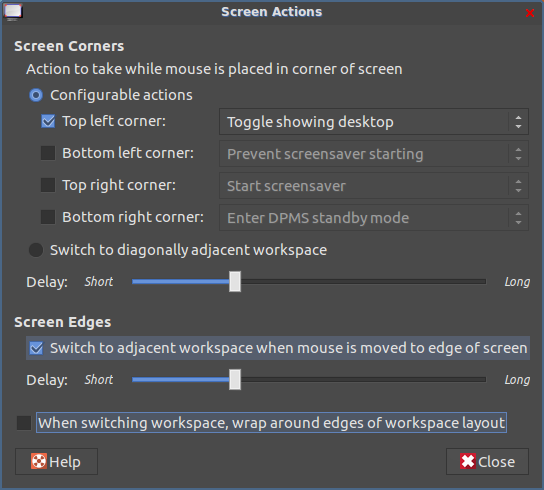 Hotcorners are just actions that get carried out when you shove your cursor into a screen corner .. if you choose, you can have one of the hotcorners open the xfdashboard (as happens in G3), but they're not the same thing. Hot Corners is the GUI interface, e.g. the settings CP. Most features are included by default. XFdashboard needs to the added separately, if you want to mimic the G3 'dashboard' feature (pictured above)'. Hot Corners, itself, is lightweight. XFdashboard adds quite a few depends, by necessity. Actually, it's a good idea to separate the two packages. Some G3 users hate 'hot-corners', and look for ways to disable it. Yeah, there are a few ways to implement hot corners. I was going to roll my own, but then I started thinking about Conky, and changed my mind. LoL !